Thou hast made us for Thyself, O Lord; and our hearts are restless until they rest in Thee. The Twenty-First Sunday after Pentecost, known as The Seventh Sunday of Luke. The Seventh Sunday after the Holy Cross; also, Our Holy Father Paul the Confessor, Archbishop of Constantinople. 11:25 AM 11/6/2011 — In today’s Gospel lesson our Lord focuses on the subject of motive; and, he tries to explain to his disciples—and to us—that our attempt to follow in the footsteps of God will only be successful if our intention is clear and our goal is sound. The two individuals who seek cures from our Lord—one for herself, and the other for his daughter—are both motivated by a deep faith in the Lord Jesus; and, both of them must contend with forces which seek to dissuade them. The Rabbi from the Synagogue must face the despair of reality, when he is told that his daughter is dead and he is too late in summoning our Lord. The woman with the hemorrhage is a particularly interesting case: most Scripture scholars agree that what St. Luke here calls a “hemorrhage” is, in fact, what is referred to in polite society as a “female problem.” The fact that it’s been unchecked for twelve years indicates its seriousness; but, more to the point, it also means that she’s unclean according to Mosaic law, and is forbidden to touch any man under pain of stoning; which puts her attempt to secretly touch the tassel of our Lord’s cloak in perspective. Both she and the Rabbi ignore these hardships because they were not interested in pleasing anyone else’s rules. “Why do I attend the Divine Liturgy on Sunday? Because the Church says I must do so. “Why do I fast during Lent? Because I am required to. “Why do I marry according to the law of the Church? Because my Church and my family expect it of me. And then when a crisis comes in our lives—as it always does—and we turn to our Church to give us solace and answers, we are disappointed to find that it has none to give; not because the Church has failed us or is somehow defective, but because we have failed to invest ourselves in the very purpose of our Church and our faith, which is the salvation of our souls. Our lives are motivated by other things. And one cannot see the destination if one is facing in the wrong direction. 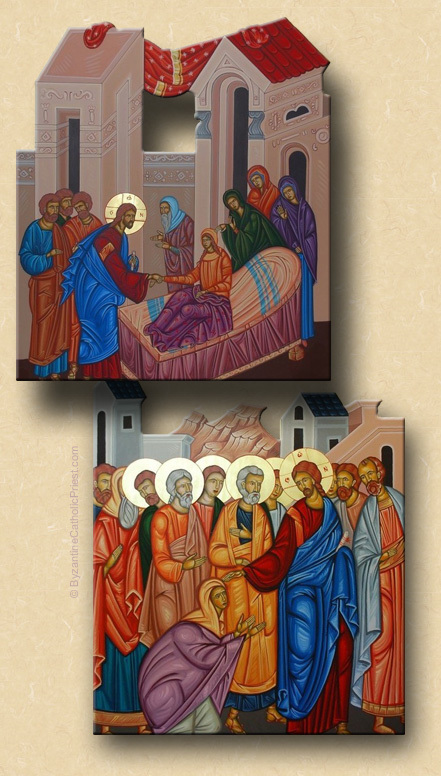 Just like the sick woman who touched our Lord’s cloak and was cured: our Lord said to her, “Your faith has healed you,” not to suggest that she accomplished this miracle all by herself, but because she threw aside every other concern and risked everything to pursue our Lord, which is what enabled our Lord to help her.